With a few extra days in a trip, you can afford to take your time seeing the sites. While that may be nice, you also don’t want to waste any time. The trick is to find a nice balance so you cover a lot of ground without feeling rushed or overwhelmed. Being a walkable city, Boston makes that easy. And if a destination happens to be a little too far for walking, their public transportation system has you covered. Keep reading while we take you through a five-day trip in Boston. Your first day in any city should always have flexible plans. You never know what delays you’ll run into and then there’s always traffic. Isn’t that fun? Assuming your first day has at least a few hours to explore, go without a specific plan. Visit the Boston Common and the Esplanade. Both are open to the public and have plenty to see and do. It’s an easy way to get your trip started and they should be on your Boston bucket list anyway. Let go of all the negative connotations that come with being a “tourist” and embrace it for a day. Every city, including Boston, is full of sites that are considered tourist attractions. Chicago has Navy Pier, Boston has the USS Constitution. Chicago has Millennium Park, Boston has the Boston Common. Chicago has Lou Malnati’s, Boston has Neptune’s Oyster Bar. I could go on for days. To encourage tourist behavior even more, we recently shared 8 tourist spots to visit in Boston. This includes the Cheers Restaurant and Fenway Park among other popular destinations you will find groups of tourists visiting. This is also a great day to visit a few monumental sites like the JFK Library & Museum, USS Constitution or Museum of Fine Arts. A few tips to keep in mind, do a little research before you go. Make sure you know the hours of the locations you’d like to browse around like museums and historical sites. Find out what their entrance fees are, if there are any tours available and buy tickets in advance for everything that you can. This will save you lots of time and it will usually guarantee your entry. Even in our three-day guide to Boston, I still included a trip to Cambridge. This neighbor city is a gem all on its own. With the Harvard and MIT campuses located here, it’s full of lively coffee shops, restaurants, bars and town squares. 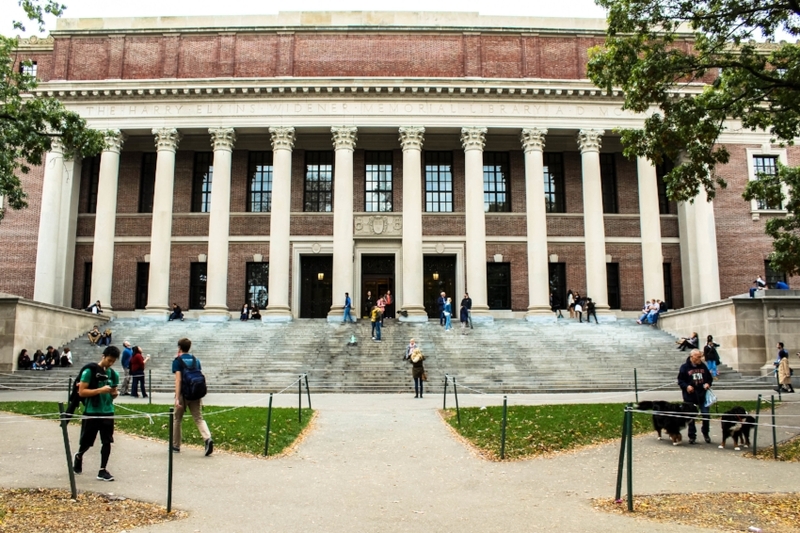 Walk through the Harvard Yard, take a photo on the steps of the Widener Library, enjoy one of the many museums from archaeology to art. Take a tour of the Harvard campus led by students, grab a cup of coffee in one of the local cafes and reflect on what you’ve seen and done in Boston so far. It’s a great place to pretend like you’re a local and just enjoy the beautiful day. For the history lovers, take a walk over to the Longfellow House - Washington’s National Headquarters. This gorgeous historical home takes tours through late October/early November before closing for the season. Grab photos of Memorial Church which has a beautiful architectural design before a bite to eat at one of Cambridge’s many restaurants. Check out our recommendations in our Cambridge Neighborhood Guide. This is the ultimate tour of Boston. It takes you through all the hottest spots in the city including the sites with the most historical significance. It’s also a great route to deviate off of in case you want to see extra sites like Acorn Street. The tour itself is free and will take you through the North End, Downtown and Beacon Hill neighborhoods. Most of the sites are free like the Granary Burying Ground, Boston Common and many churches. You can view all of them and grab photos but several like the Paul Revere House cost an admittance fee. Do a little research beforehand to create a route that suits your interests and allows you to veer off course if you’d like. This is also a great time to check out any of the freedom trail destinations that allow you to explore inside. Check out their hours and if there are any admittance fees so you can budget both time and money. Again, anything that you can purchase in advance is ideal so you can skip potential lines and save time. I can’t think of a better way to end a trip than eating your way through an Italian neighborhood. Am I right? The North End has everything from Neptune’s Oyster Bar to traditional white tablecloth Italian restaurants and pastries so divine and indulgent, you’ll feel guilty for weeks. If you’re lucky enough to walk through on the weekends, they have a farmer’s market in the morning with all kinds of produce and fish that were caught that morning. Being a Midwestern native, this is something I have never seen before so it was pretty cool. A few recommendations while you’re eating your way through the North End. Grab coffee at Thinking Cup. This local coffee shop has incredible lattes and cappuccinos and there’s a ton of space to sit down and take your time. Grab some pizza at Umberto’s Galleria or Locale. They’re two different experiences so it depends on what you’re looking for. Umberto’s has traditional Sicilian-style pizza offered first come-first serve during lunch and is cash-only. Locale is a more trendy pizza joint with equally tasty pizzas that have every topping you can imagine plus appetizers and a great drink list. Grab some sweets at Mike’s Pastries but be ready to wait in line. If you still have room left, head over to La Galleria 33 for mind-blowing pasta. As far as I’m concerned, you haven’t had Italian until you’ve had pasta.